Finland holiday cottage. 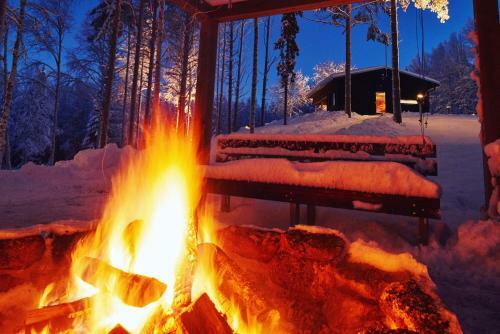 Set in Sonka, Lapland Riverside Cabin features self-catering accommodation with a terrace and free WiFi. The property has river views and is 24 km from Rovaniemi. This 2-bedroom villa comes with a seating area, a flat-screen TV and a kitchen with a dishwasher. The bathroom comes with a bidet and a hair dryer. Guests can make use of the sauna. A barbecue is available on site and fishing can be enjoyed within close proximity of the villa. Rovaniemi is 24 km from Lapland Riverside Cabin. The nearest airport is Rovaniemi Airport, 25 km from the accommodation.